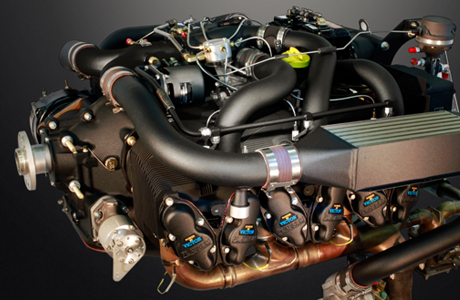 The “Power-By-Victor” XR555 Big Bore™ Engine overhaul is designed to provide the largest cubic inch displacement and torque available for a TCM IO-550-B, C, G or N engine installation. 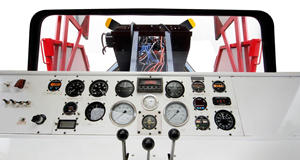 Engine applications include Beechcraft Bonanza - Baron - Cessna 350 -Cirrus SR22 - Columbia 350 - Lancair Legacy - Mooney Eagle and Ovation aircraft. The XR555 Big Bore™ overhaul process includes all of the “Power-By-Victor” XR Black Edition® VII special engine processes with the addition of larger diameter precision choked XR555 Big Bore™ new cylinders and pistons. Tuned fuel injection nozzles and a precision profiled camshaft is also included. Engine displacement is increased to 555 cubic inches providing maximum engine power. Installation of the XR555 Big Bore™ engine requires no Supplemental Type Certificate and standard engine installation procedures are applicable. Full Coverage for 60 Months or TBO whichever occurs first. Due to thermal changes, moisture conditions, airborne contaminants, and exposure to salt air, aircraft engines can deteriorate quickly and develop premature parts fatigue. To reduce these premature fatigue effects Victor Aviation has developed proprietary formulated Ceramic-Silica and Polymer materials for exterior engine and component finishing on XR BLACK EDITION® VII engines. These extremely tough and durable high temperature corrosion resistant finishes are applied on the aircraft cylinders, crankcase, induction system, housings and other critical parts. Finished parts are oven baked and specially cured to make a magnificent textured Black Matte finish on XR BLACK EDITION® VII engines, significantly improving parts longevity and performance. 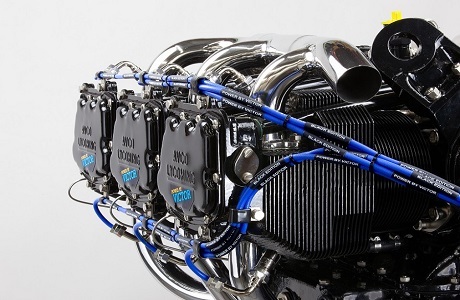 XR BLACK EDITION® VII engines come with the ultimate in electrostatic powder coat finishing that enhances the durability, corrosion resistance and heat dispersion of engines. Designed to withstand extreme and the toughest conditions. Victor Aviation has been uniquely applying high quality powder coat materials for over twenty five years on aircraft engines and has partnered with a Fortune 500 company to provide a special textured XR BLACK EDITION® VII Matte Black finish with exceptional heat dispersion and corrosion protection qualities. Material has exceptional ultraviolet, chemical, solvent, salt air and impact resistance while maintaining the high hardness and flexibility needed for optimum performance. 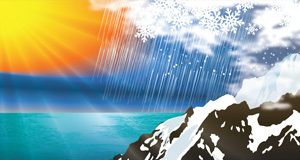 Material specifications meet or exceed salt spray resistance ASTM B- 117/ AAMA 2603. Inertia supercharging is a process to maximize the volume of air trapped in the cylinder for combustion by precisely timing and delivering the proper charge of air. This phenomenon takes advantage of the natural dynamic effects and inertia of the air during the intake cycle. Engine RPM, cubic inch displacement, and air flow are related factors that are evaluated to help determine proper engine performance and horsepower which contribute to the inertia supercharging effect. By maximizing the kinetic energy of the air flow into the cylinders with the inertia supercharging effect, the volumetric efficiency is improved and also engine power. Aircraft engine applications involve exposure to oxidizing fuels, heating and corrosive sources. All non-oxide materials used on engines will undergo oxidation and form some combination of solid, liquid or gaseous reaction to these environmental conditions. It is this oxidation behavior that can cause detrimental effects on engine parts. Special high temperature Silica Ceramics with good chemical stability and strength at high temperature oxidizing environments are used on XR BLACK EDITION® VII engines to increase heat dispersion and enhance parts performance. Engine parts are pneumatic plastic shot peened, degassed to remove any contaminants, a conversion coating is applied and final coated with a specially formulated XR BLACK EDITION® VII Black Silica Ceramics. Materials are oil, fuel and corrosion resistant, and can withstand temperatures up to 1300 degrees Fahrenheit. Engine parts are manufactured using grinding and cutting methods that can cause high surface roughness or irregularities in metal surfaces causing an anisotropic surface. This means that the surface irregularities of the parts all run in the same direction. These grinding marks can also interfere with non destructive testing of a part’s surface. This F.A.A. accepted process enables technicians more reliable test indications when testing parts. 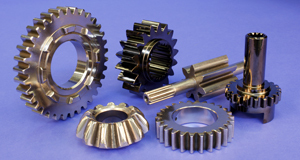 Isotropic surface finishing means that the part has been surface finished, or honed, to obtain a surface that has no discernible pattern thereby reducing friction, heat, noise and reduces contact fatigue. 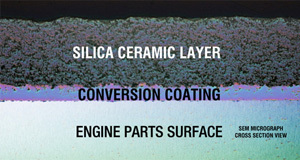 By exposing internal engine parts to a series of improved surface finishing techniques, these surface roughness problems are reduced resulting in longer parts life, smoother parts operation improved lubrication and better fuel efficiency. Cylinder combustion chamber and intake port volumes are cubic centimeter (CC) tested for uniformity by fluid test methods for improved engine power and superior engine smoothness on XR BLACK EDITION® VII engines. New cylinder castings have varying intake port and combustion chamber volumes and can cause changes in individual cylinder horsepower output. A cylinders position installed on an engine can also change individual cylinder horsepower output due to changes in available induction air flow and cylinder cooling causing uneven cylinder effective compression ratio balance. By balancing the individual CC level of a cylinder to the available induction airflow and cylinder position on an engine, a superior improvement can be obtained in providing for the ultimate in enginesmoothness and power balance of an engine. Engine intake air flows in and out of the combustion chamber through the intake and exhaust system by the opening and closing of the valves. 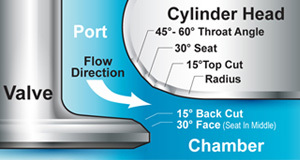 As the air passes through the cylinder intake and exhaust ports, the flow of air can be affected by the curvature or radius of the openings caused by the shape of the valve and seat angles. Using specialized equipment, Victor’s technicians can shape these openings and improve the airflow and venturi characteristics by blending an improved curvature radius into the airflow path. Multiple angle valve and seat machining is very effective in making the air flow more efficient. As a result, improved engine performance and fuel efficiency can be obtained with an enhanced throttle response. To reduce residual parts stress and improve engine performance, Victor Aviation has a unique F.A.A. accepted patent issued process to test parts over a 600 degree range in temperature from -300 to +300 degrees Fahrenheit. 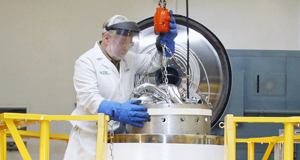 This non destructive testing process is performed in a computer controlled vacuum insulated cryogenic processing chamber over a several day period in a Liquid Nitrogen atmosphere with real-time ultrasound material monitoring. This testing process can relieve residual parts stress, detect for improperly machined or heat treated parts by measuring material volume changes, provide for longer engine life, better fuel efficiency, and improve engine performance. Vibratory stress relief testing is performed by vibrating engine parts at a sub-harmonic vibration frequency while real-time monitored with a full domain spectrum analyzer. 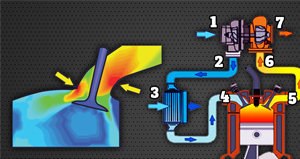 This process measures changes in residual stress concentrations of engine parts. Subsequent to manufacturing processes such as grinding, machining, casting and hardening high concentrations of residual stress may develop. During the life of a part these stresses may cause a part to distort or prematurely fail. This F.A.A. accepted testing process is also used to provide for more reliable magnetic test indications during non destructive testing of engine parts as a result of any shifting of material composition due to stress changes. Using this process can improve parts longevity and durability by neutralizing residual stress and enhances parts performance. Shot peening is a F.A.A. 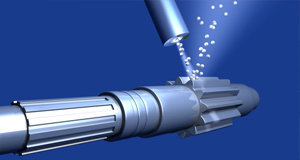 accepted process accomplished by the pneumatic impingement of metallic, glass or plastic shot on critical engine parts. As a result of this process the parts fatigue strength and resistance to stress corrosion cracking is improved by enhancing parts residual surface compressive stress. Nearly all fatigue and stress corrosion failures originate at the surface of a part, but cracks will not initiate or propagate in a compressively stressed zone. Compressive stresses are beneficial in increasing resistance to fatigue failures, corrosion fatigue, stress corrosion cracking, hydrogen assisted cracking, fretting, galling and erosion caused by cavitation. As a result of this unique process, critical stressed surface areas prone to stress corrosion cracking are shot peened to provide for longer lasting more durable parts life. Parts are NDT tested using eddy current electromagnetic induction on electrically conductive engine parts. This process is very effective especially on non magnetic materials such as aluminum castings, crankcases and housings. The advantage of this method is that it can detect fractures or porosity problems beneath the surface of the material that are not detectable by surface inspection techniques on magnetic and non magnetic parts. Eddy current uses alternating electrical current flowing through a coil at a chosen frequency and generates a magnetic field around a coil or probe. When the coil is placed next to a conductive material, eddy current is included in the material. If a flaw in the conductive material disturbs the eddy current circulation such as a crack or porosity problem, the magnetic coupling with the probe is changed and a defect signal can be read by measuring the coil impedance variation. Using high frequency high speed sound waves, parts are scanned to gauge their integrity, check for flaws and material characterization. A pulse-echo ultrasonic measurement can determine the location of a discontinuity within a part or structure by accurately measuring the time required for a short ultrasonic pulse generated by a transducer to travel through a thickness of the material. The pulse then reflects from the back or surface of the discontinuity and is returned to the transducer and can identify flaws internally in a part. Using ultrasonic high speed ultrasonic velocity testing can significantly improve engine longevity by detecting sub surface flaws that could have developed into future parts failure. 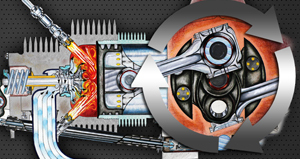 Extracting maximum performance from the valve train is essential for best power, smoothness and longevity. 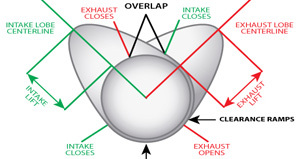 As an engine’s valves open and close, the contact angle between the valve and the rocker arm becomes critical to proper valve operation and engine performance. 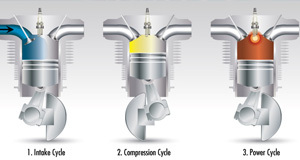 Any valve side loading can decrease cylinder efficiency and reduce available horsepower. Victor’s XR BLACK EDITION® VII Engines are precision machined for minimum valve side loading for better power, performance and reliability. To help achieve consistency, valve spring pressures and heights are matched for more efficient engine operation. The hydraulic lifters and camshaft are matched for identical bleed down rate timing to assure uniformity of independent valve overlap and maximum throttle response. Internal engine parts are very sensitive to the effects of corrosion which can cause premature failure of the engines camshaft, hydraulic lifters and gears. Iron manganese phosphate coating is a F.A.A. accepted process of acid etching a lubricant into steel parts to reduce friction, provide for corrosion protection while improving fuel efficiency. 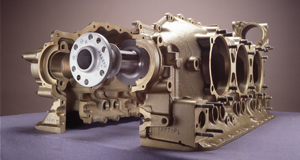 When new parts are installed in an engine there are initial contact surface break-in effects. 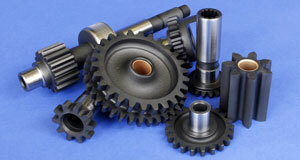 Phosphate coating will assure a smooth initial contact break-in effect and also improve parts pitting fatigue life. Friction is reduced by the smoothing of the asperities of the mating gear surfaces and aids in keeping the gear tooth surface shape. This chemical conversion treatment forms a crystalline coated surface which provides for a significant improvement in contact fatigue strength and can greatly improve engine parts life. 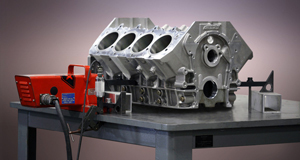 Crankcases are straightened, then precision milled and final machine bored utilizing precision boring equipment to assure proper alignment and size. The journals are also finish tested for size and journal geometry by airflow differential procedures to assure a precision fit of the bearings to crankcase halves. This procedure minimizes piston side loading, reduces bearing wear and provides equal loading on crankshaft main journals. 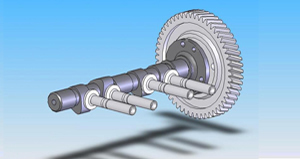 This line boring process reestablishes the centerline of the crankshaft axis, thereby insuring the centerline is parallel and equidistant to the cylinder deck planes for enhanced engine performance. Engine thrust may be increased by reducing the amount of power wasted in attempting to offset counterbalancing forces induced by out-of-balance internal components. 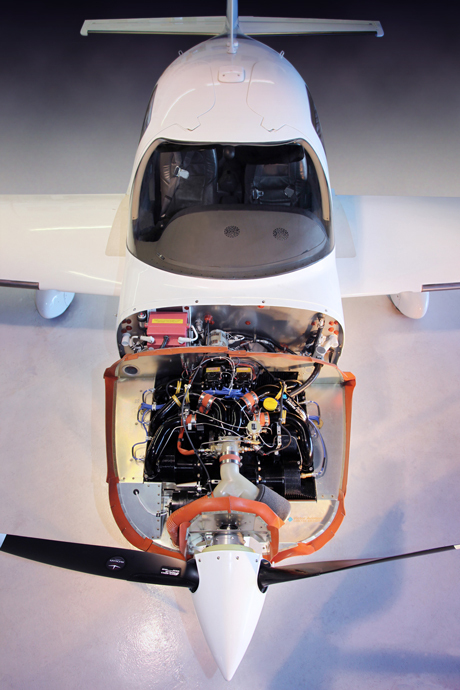 Improving parts balance allows the engine to deliver more power to the propeller and the engine becomes more efficient with less wear on internal moving parts. 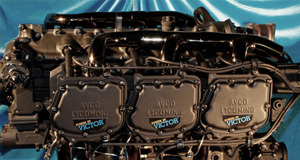 “Power-By-Victor” BLACK EDITION® V Engines are uniquely real-time motion balanced by Victor’s A.S.E certified master machinists to within one gram. With this F.A.A. accepted process, individual parts and cumulative reciprocating mass weights are balanced, to provide for the best longevity and smoothness of the engine. Balancing not only improves thrust but also reduces pilot and passenger fatigue by lowering the amplitude of various vibration frequencies generated by the engine. Engine testing at Victor Aviation is the most extensive procedure used in the industry and performed over a several day cycle process. Victor’s state-of-the-art mobile engine testing apparatus, incorporates a thrust velocity load cell that measures the actual thrust force of the propeller. Engines are installed into a hydraulically activated engine mount, with engine accessories, induction system and exhaust system installed, to simulate real-time engine test parameters. 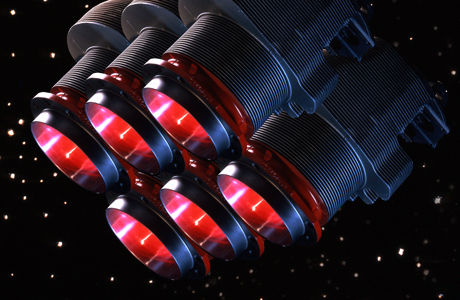 Using an electronic load cell wafer, the engine’s real-time thrust velocity is recorded at all engine speeds. During the test process special dyes are put into the oil system and examined under a black light canopy to detect for any discrepancies. Engines are tested at maximum power and must meet Victor’s rigid test standards assuring the highest level of quality control. Internal engine components move at varying rates of motion and produce different frequencies. 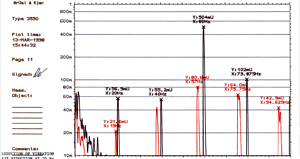 These components can be individually revealed by plotting vibration amplitude against frequency. 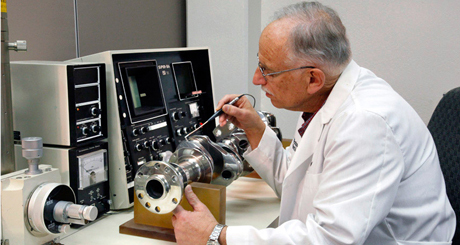 The breaking down of vibration signals into individual frequency components is called frequency analysis, a technique which may be considered the cornerstone of diagnostic vibration measurements. Using a full domain frequency analyzer the frequency and amplitude of a components vibration level can be detected using a tri-axial piezoelectric accelerometer. This F.A.A. accepted testing process enables Victor’s technicians to not only test for complete engine balance but isolate exactly what internal engine components are in need of correction. This level of engine vibration analysis by far exceeds industry standards and enables Victor's technicians to identify engine design and component problems allowing for a smoother running engine. 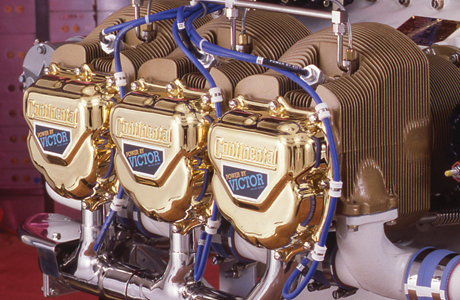 Volumetric efficiency testing measures airflow into each cylinder and allows Victor Aviation to match cylinders for maximum power so that the pilot can have the benefit of using all available power uniformly and efficiently with all cylinders. With this F.A.A. accepted process of polishing and removal of surface flashings of the intake and exhaust systems, a significant improvement in volumetric efficiency is available. After cylinders are volumetrically balanced all cylinders produce uniform airflow to provide for improved uniformity of power distribution. Air flow balancing is performed at multiple valve lift openings to assure for the best in engine fuel efficiency. Such precision tests are virtually unique in the aircraft industry to “Power-By-Victor” BLACK EDITION® V Engines. A hydraulic valve lifter is a device that converts the rotary motion of the lobes of the camshaft to linear motion to actuate the engines valves while taking up the slack in the valve train. 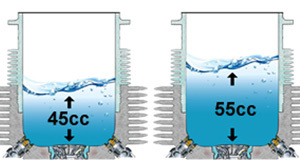 Valve train clearances change with temperature as the engine heats up and cools down, so the hydraulic lifters have to constantly compensate for thermal expansion of the crankcase, cylinders, pushrods, valves and other valve train components. 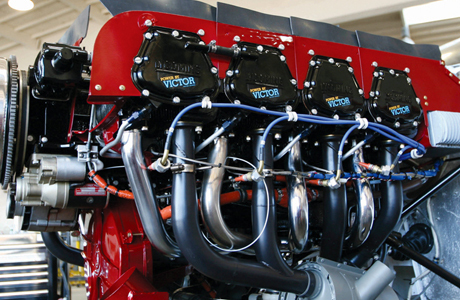 By the precision matching of hydraulic lifters with identical bleed down rates to a properly profiled and matched camshaft assembly, Victor's technicians can assure uniformity of independent valve overlap timing and maximum throttle response. This allows for smoother engine operation, improved fuel efficiency and increased engine performance. 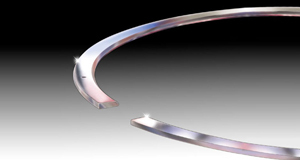 Piston ring sets come pre-gapped from the parts manufacturer and are not matched to precision fit a cylinder bore. That simply isn't precise enough where gaps should be accurate to within 0.001 inch or less for best engine power. A XR555 Black Edition® VII Engine Overhaul is a Proprietary Trademarked Overhaul Process created by Victor Aviation Service Inc.